The vast majority of drugs, nutrients, herbs and even placebos have a set of Common Side Effects that will be briefly talked about here. While each substance has its own unique set of side effects, nearly all have some side in common with all others. In fact, this is one of the reasons that 'Double-Blind Placebo-Controlled' trials are done. Placebo controlled trials not only separate out the beneficial effects of Substances from the beneficial effects of Placebos, but also to separate out the side effects of the substances from the common side effects of placebos! Since these common side effects would need to be repeated on every single page for every single substance, side-effects-site.com has no interest in boring you with the same bulleted list of meaningless side effects that you can find on Wikipedia or WebMD. We are interested in giving you helpful guidance about the most meaningful side effects, how they can impact your life, and what you can do about them. We realize, however, that many of you may be interested in the Common Side Effects of the vast majority of substances- including placebos. Therefore, we have included a common side effects list here in order to better serve you. If you experience any digestive complaints while taking a substance, check to see if you can take it with food if you are not already. And if you ARE taking it with food, make sure that you take it in the middle or at the end of a meal and not at the beginning- you can also try taking it with your EVENING meal instead of the morning meal as that can often make a big difference. If this is still a problem, then you can ask your pharmacist about any other formulations or if there is an 'Enteric Coated' version that has a coating that prevents the substance from dissolving in your stomach. In the case of oil-filled or gel-filled pills, sometimes freezing them and swallowing them frozen can prevent them from dissolving in your stomach and causing stomach upset. An example of this are the Side Effects of Omega 3 Fish Oil that can cause you to burp or get a fishy taste in your mouth. For dry mouth, you can simply drink more fluids if your medical condition allows this. Do NOT increase fluid intake for dry mouth if you are taking diuretics or 'water pills', they are DESIGNED to dry you out and chewing gum to alleviate the dry mouth is a better idea. Constipation is one of the common side effects that deserves its own section. If you get constipation from taking any substances, there are many solutions to this. The first is obviously to either not use that substance, or to ask about a different formulation that will not make you constipated. If that is not possible, then there are many solutions to constipation that are easy and logical, but rarely used. Increasing water intake is one of the simplest remedies. Many drugs can cause dry you out and getting more water will solve this problem. Do NOT drink more water if you are becoming constipated from diuretic usage unless you speak to your doctor first. These drugs are DESIGNED to dry you out and drinking large amounts of fluids could defeat the purpose of taking those drugs. You want to AVOID laxatives except on RARE occasions, as one of the Side Effects of laxatives is the depletion of electrolytes. Often taking Magnesium, as outlined on the Magnesium Dosage page can remedy the situation. There are many substances that DEPLETE magnesium, so constipation COULD be a Sign of Magnesium Deficiency that occurred because of magnesium depletion. Therefore, magnesium, rather than being a 'quick fix', is remedying the underlying problem. If getting more water and taking magnesium does not resolve a chronic constipation issue, then download the Constipation Relief EBook that will walk you through everything that you need to know to get natural and lasting constipation relief. 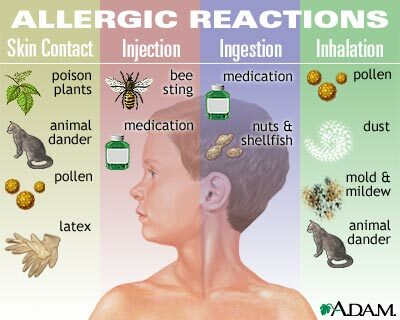 If you get any allergic reaction from a substance, then it's likely that you will be unable to take that substance. If the reaction is mild, you could try another formulation that you may not react to as sometimes the allergic reaction is not from the substance ITSELF, but an INGREDIENT in the pill. An example of this is when someone experiences mild allergic reaction as a Side Effect of Vitamin D, it is most often the case that the oil that the vitamin d is packed in has gone rancid. Getting a formulation that does not contain oil often solves this problem. But if you have a SEVERE allergic reaction that includes swelling and shortness of breath, this is called an 'Anaphylactic Reaction' or 'Anaphylactic Shock'. This severe reaction usually requires a trip to the emergency room and can be extremely scary and even deadly. If you have this reaction even ONCE with any substance or food, then that substance must be avoided forever. If there is any possibility of accidentally coming into contact with that substance again, then you may want to speak to your doctor about getting an 'Epi Pen' to have with you at all times. It is a self administered injection of a medication that can improve symptoms if you begin to have an anaphylactic reaction. If you get a rash from an oral medication, then it is more likely due to an allergic reaction, and you can follow the guidelines in the allergy section. When using a substance in cream or gel that is applied to the skin, some people can get redness or irritation. If it is minor, you can simply do a test area of the substance on the kin that is 'tougher' like the lower arms and see if that solves your problem. If it does not, then you'll need to avoid that substance and speak to your doctor about getting an alternative. Headache is another one of the common side effects that deserves its own section. Just like constipation, it could simply be due to the depletion of magnesium by the substance that you are taking. Follow the instructions on the Magnesium Dosage page to see if that helps. Headache could also be caused by dehydration or because of an impure substance, such as a rancid oil. If the magnesium and drinking more water does not help, then try changing to a different formulation. If that does not work, then you'll need to avoid the substance and /or speak to your doctor about an alternative. Unless you are simply experiencing Caffeine Side Effects, restlessness, anxiety, and insomnia are all Signs of Magnesium Deficiency and could be triggered by some of the many drugs that lead to Magnesium Depletion, such as Acid Reflux Medication. These common problems can often be alleviated by following the instructions on the Magnesium Dosage page. Be sure to take any pills that cause insomnia in the morning instead of the evening. If magnesium doesn't relieve these symptoms, then speak to your doctor about an alternative. Common Side Effects of substances, unfortunately, include fatigue. This can be from MANY reasons that you are not able to do anything about. But many drugs do deplete nutrients, and a possible solution is to take a professional quality multivitamin supplement such as Jigsaw Health's Essential Daily Packs in order to replenish any lost nutrients that might be causing your problem. Also, a too low blood pressure or too low blood sugar could be causing the fatigue, something you’re you will need to address with your doctor. Otherwise, attempt to get a good night's sleep and eat well. If these do not solve your problem, then speak to your doctor about an alternative. This is FAR from a complete list of the Common Side Effects that you may experience with any substance that you take. If you believe that you are having a side effect or adverse reaction to a substance then look on the page of that specific substance. If you can't find the side effect that you are experiencing, and it is worrisome to you, then contact your local pharmacy and/or your doctor to see if there is anything that can be done. Hopefully, it has been helpful and has helped you to solve some of the more common problems that occur with ANY substances you might take.